There's a bit of a trend these days for making jam and marmalades out of non-fruity things - chillis and onions being quite prominent. 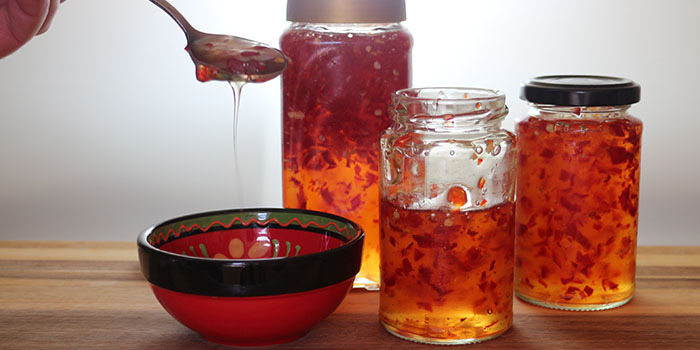 This chilli jam is easy to make and totally wonderful. Cut the green tops off the chillis and chop the flesh very finely. If you're averse to chilli heat, remove the seeds first. Pectin is what makes jam set. It's present to varying degrees in most fruits, but not in chillies. You can buy liquid pectin and you'll want to use about 100ml (3.5 fluid ounces) of it. Alternatively, you can make your own liquid pectin by boiling 4 cooking apples (eg Bramleys) to a pulp, liquidising, straining and reducing it. Or you can use jam sugar, which is regular sugar with pectin added. Add the sugar to the vinegar and cook until the sugar has dissolved. Add the chillies and bring to a rapid boil. Add the pectin towards the end of cooking (prolonged cooking destroys its setting ability). The jam needs to reach its setting point, which is 105°C (221°F). Use a digital or jam thermometer to check the temperature. If you don't have a thermometer, you can test by placing a spoonful of the jam on a small plate that has been in the freezer for 10 minutes. Let the jam cool for about a minute, then push the edge of it with your finger. The surface should have set into a kind of skin, and that means your jam is ready. Let the jam cool for 15-30 minutes, then pour it into sterilized jars. As the jam cools and sets, you'll want to turn it over occasionaly to try to get the chilli flakes distributed evenly. You can also add a finely chopped red bell pepper to the jam, which gives a denser, redder, finished product, but it's just fine with just chilli. The video above is from the Keef Cooks YouTube channel. Click here to see the video recipe of Chilli Jam on YouTube. Prep time: 10 minutes. cooling / setting time: 1 hour.